Abbott and Bigfoot Biomedical announced that the companies have entered into an agreement to develop and commercialize diabetes management systems, integrating Abbott's FreeStyle Libre glucose sensing technology with Bigfoot's insulin delivery solutions in the United States. Philips Healthcare announced the launch of its next-generation Patient Monitoring solution in the U.S. The new offering in the solution, IntelliVue X3, has received 510(k) clearance in the U.S. This product launch helped the company to expand its patient monitoring solutions portfolio. Growing geriatric population and increasing number of people diagnosed with the chronic diseases such as cardiac disorders, diabetes and various respiratory diseases is resulting in an increasing demand for patient monitoring devices in North America. The North America patient monitoring devices market is majorly driven by technological advancement in diagnostic devices and is anticipated to witness lucrative growth with a CAGR of 5.6% over the forecast period 2018-2024. Further, the North America patient monitoring devices market size is expected to increase from USD 1,881.8 Million in 2013 to USD 3,329.9 Million in 2024. It is also expected to achieve Y-O-Y growth rate of 6.0% in the year 2024 when compared to the previous year. Further, growing investment in technological innovations in this region is expected to offer many opportunities for the strong growth of the patient monitoring devices providers. The U.S. patient monitoring devices market is estimated to have a dominating market size by the end of 2024 and is expected to achieve Y-o-Y growth rate of 6.1% in 2024. 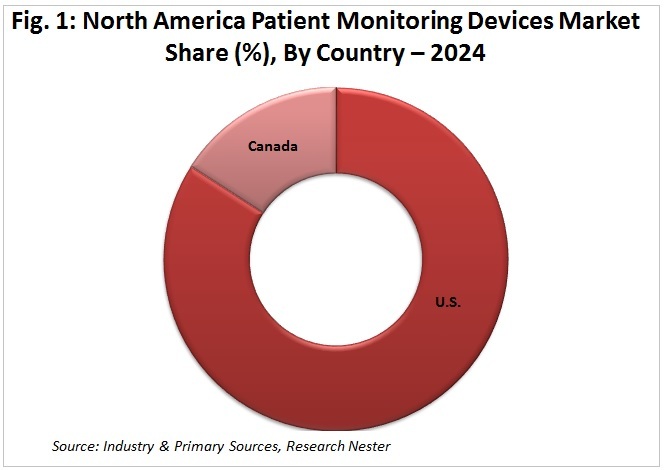 Further, the Canada market of patient monitoring devices is expected to expand at a CAGR of 5.0% during the forecast period 2018-2024. 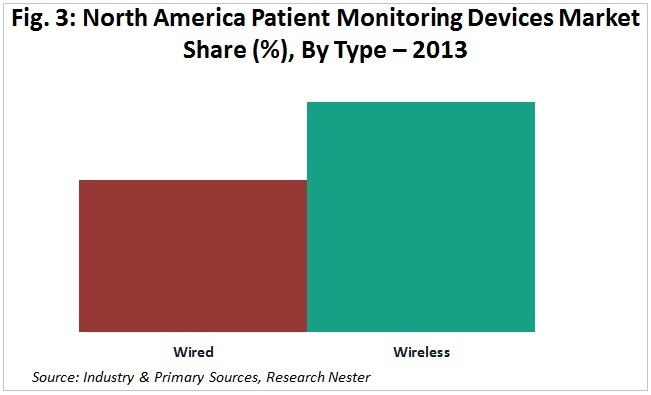 The North America patient monitoring devices market is segmented on the basis of technology into wireless and wired devices within which the wireless devices segment is expected to grow significantly over the forecast period. It has also been observed that there is an increasing demand for wireless devices due to their better portability and ease of handling. Further, due to the higher rate of adoption of superior technology, there is an increasing dependence on wireless devices with respect to traditional wired devices. 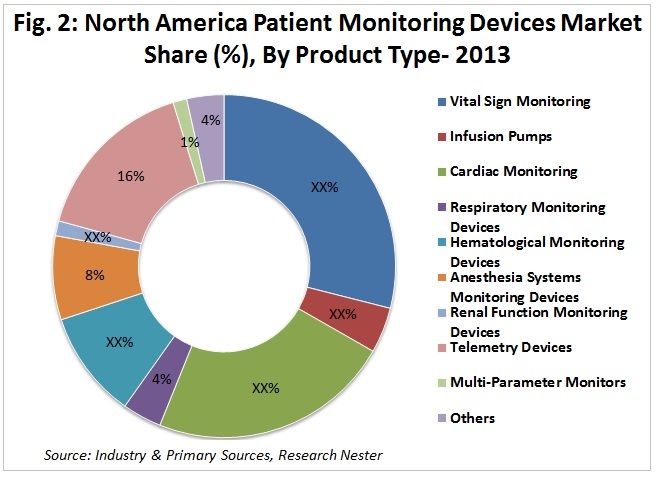 The North America patient monitoring devices market is segmented on the basis of end-user into hospitals, clinics, research institutions, ambulatory surgical centers (ASCs) (comprising of independent endoscopy centers, day surgery centers etc. ), independent ER centers, independent long term acute care and nursing centers and within these segments, there is a high demand for patient monitoring devices from the hospital segment. The hospital segment accounted for more than 55% of the total market share during 2013 and is estimated to grow positively in upcoming years. However, with the changing landscape of the healthcare industry in US, it is expected that ambulatory surgical centers would showcase a much higher demand for these devices in upcoming years. The North America patient monitoring devices market is thriving on the back of the behavioral factors such as the use of tobacco, unhealthy diet and obesity, physical inactivity and harmful use of alcohol among people which are further increasing the risks of cardiac diseases in the existing generation. More than 17 Million died from the cardiovascular diseases during 2016, out of which, 85% were due to heart attack and stroke and in the United States alone. This growing prevalence in the number of cardiac deaths is anticipated to drive the expansion of the North America patient monitoring devices market. Further, homecare telemedicine is driving the market growth. The main benefit of remote patient monitoring or homecare tele-health is that it allows a patient to use a mobile medical device to perform routine tests and send test results to a doctor in real-time without the necessity of visiting a medical institution. This factor is anticipated to increase the demand for patient monitoring devices over the forecast period. Additionally, timely & proper treatment at an early stage, proximity to home and community, reduced travel and wait time as well as rapid diagnosis & fast intervention by the doctors are some of the major factors that play major role behind the preference by consumers for human patient monitoring devices. The changing government policies along with patient and doctors’ skepticism towards using technologically advanced devices is anticipated to create a hindrance in the steady growth of the patient monitoring devices market over the forecast period. Some of the affluent industry leaders in the North America patient monitoring devices market are BioTelemetry Inc., Medtronic, Honeywell HomMed, Boston Scientific Corporation, Applied Cardiac Systems Inc., GE Healthcare, Philips Healthcare, Roche Diagnostics, Abbott Laboratories and Paragon Medical Supply Inc.
Medtronic partnered with Fitbit for diabetes tracking. This tie-up was a Medtronic's step to instill latest technology into its CGM portfolio. Further, Medtronic is focusing to expand its product offering through acquiring various companies such as Covidien among many others which is believed to help the company to grow and expand their presence throughout the world. The company is looking forward to strengthen their presence through expanding their operational areas. Moreover, manufacturers are constantly working with research institutions, healthcare facilities etc. along with the in-house R&D resources to understand the technology gap and patient demands and address these requirements with innovative products. These could be self-funded or done under government initiatives.